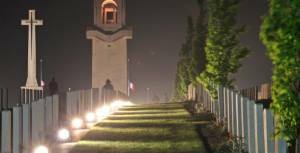 A few kilometers from Amiens, every year on April 25, the Australians and New Zealanders commemorate ANZAC Day in memory of the fallen soldiers in the Somme during the First World War between 1914 and 1918. 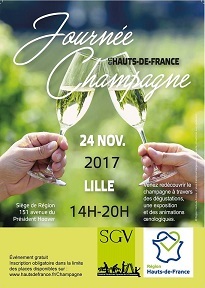 For the first time, the products from the region will be associated with this event, producers will be present in the city center until 12:30 pm: Guillaume Leulier, Cueillette en Baie de Somme, Etienne Devantoy Brasserie Charles et Vianney, - Maison Trogneux, Macaroons, Philippe Bequet, products of the beehive. ANZAC (Australia and New Zealand Army Corps) is an Army Corps of Australians and New Zealanders during the First World War. These troops, whose first important action took place in Gallipoli on April 25, 1915 - the date witch set the annual commemoration - also fought on the Western Front during the Great War, particularly in the Somme, in Villers-Bretonneux, where they have distinguished themselves. The ANZAC Day ceremony, the "Dawn service", is organized annually by the Australian state. It celebrates the memory of the soldiers who fought during the famous battle of Gallipoli, but also all those engaged on the fronts of the Somme during the Great War. On the occasion of Dawn Service, nearly 8,000 participants are expected during this moving ceremony. Romain Godefroy opens the doors of his breeding of horned animals ... You will discover his passion for the thousands of animals that graze at his place ... After this visit, you will know all about ... Snails! With Romain, at least you are certain that your snails come from our region! Other Bienvenue à la Ferme producers will also be present. 350 exhibitors meet the 60,000 visitors to the cheese and wine fair. This year, the Hauts-de-France will be the region under the spotlight with the marquee "Terroir" stands 197 to 212. Present producers: Brasserie des 3 loups (beers) + Distillerie Persyn (juniper) + Laiterie des 2 fermes (maroilles) + Tricart Frédéric (garlic smoked from Arleux) + Maison Despinoy (bêtises de Cambrai) + France Terroir (pies and croque maroilles, maroilles and boulette d'Avesnes) + Champagne Daniel Gerbaux + Champagne Leclère-Torrens + Miellerie de la Divette + la Confrérie du Maroilles (Friday only) and regional brands "Saveurs en Or" and "Terroirs Hauts-de-France". We are all waiting for you at Coulommiers from Friday. On the occasion of your visit to Berck, a visit is required at "Comptoir de l'Authie". Jerome is waiting for you to make you discover all the gastronomic specialties of our region. He is unbeatable and knows all the producers, so he will be the best advisor. Beers, terrines, jams and other biscuits have no secrets for him ... but he has another string to his bow: cheese ... in his other establishment, he will make you discover the immense taste palette of our regional cheeses. 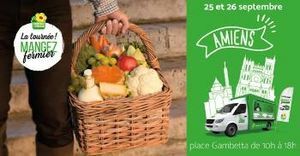 In Hauts-de-France and with Jerome and the "Comptoir de l'Authie" in particular, I eat local ... and you? An event not to be missed! At Ermenonville Park (Oise) - Entrance : Place Clemenceau - from 9:30 to 18:00. Thanks to Guillaume Leulier au Temps des Mets in Abbeville for this organization. Of course, even the best beers are tasted in moderation. Every 1st and 3rd Saturday of the month they offer you seasonal organic or local products. So, do not hesitate to visit them at Nouvion en Ponthieu! Since 1872, it has delighted the taste buds of young and old with its entire range of macaroons and chocolates. Trogneux House, a family saga. The first, Jean-Baptiste, was a pastry baker settled in downtown Amiens, in the district Gambetta-Delambre-Dumeril (where is the current confectionery), he realizes puffs and desserts. Later, he will also propose the famous "macaroons of Amiens" which partly made the fame of the family. The second generation continues the work of the founder, enlarges the shop. The third generation, John's, second name, knows war and destruction. Afterwards, it is Jean-Alexandre who takes the reins of the House and recently Jean-Baptiste. 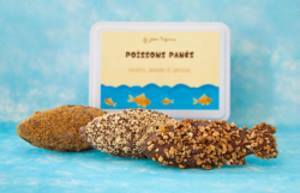 A kick of youth in the productions ... the fish of April are now "breaded" .. and guaranteed without edges: Milk chocolate covered with hazelnuts, almonds and caramelized speculoos ... Bravo, Jean-Baptiste! Thank you to Courrier Picard for the photo of Jean-Alexandre and Jean-Baptiste. 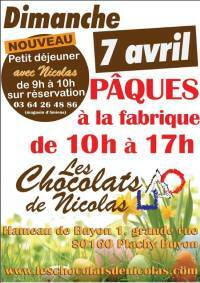 Plachy-Buyon (a few kilometers from Amiens), 1 big rue du Hameau de Buyon - Sunday, April 7th from 10am to 5pm. Since Easter is fast approaching, Nicolas Haag Wallet opens the doors of his workshop. You will be able to discover all the magic of chocolate work. On reservation, you can also share breakfast with Nicolas Haag Wallet (registration 03 64 26 48 86). Come admire the work done by this artist. So, everyone at Plachy-Buyon this Sunday. You have a very wide choice, so do not hesitate, enjoy yourself and delight your guests. 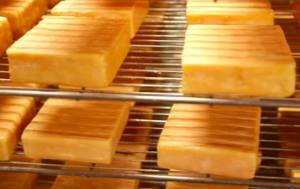 To learn more about Terroir cheese producers Hauts-de-France. Many Relais Terroirs offer you cheeses and make up for you regional dishes. Find the one near you. The producers will give you an appointment one more time at "Place du Linciau" from 4.30pm. Come and buy seasonal products directly from producers. To buy at the Flavor Market means to fight for a local and qualitative food, paying enough producers. So, everyone in Bresles on Friday, March 29th! Since 2006, March 20th has been dedicated to the (international) celebration of the macaroon. 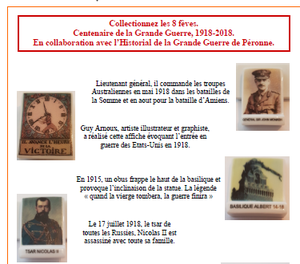 So, let's celebrate the Macaroon of Amiens! A specialty of Amiens since the 16th century, introduced by Catherine de Medici, it still knows a prestigious success. It is the emblematic product of the city. The recipe, composed only of natural products, has not changed since 1872: Almonds Valencias, sugar, honey, egg white, sweet almond oil and bitter almonds (no preservatives or dyes). If Maison Trogneux is the most famous, other producers also make it, each having its specificity. Article excerpt from Courrier Picard. Her dairy products are diversifying. After the arrival of yogurts, faisselles or even whole milk, Caroline Binant has developed recipes of rice pudding or cream dessert with speculos. She is also working on new yoghurt flavors. "But I will not make butter or cheese", says Caroline Binant, the one that some customers now call "Madame Popinette". The former dietician does not regret her change of career. "We quickly took off in 2015. We are happy." Thanks to Courrier Picard for this article. The Hauts-de-France were particularly honored for this 2019 edition of the International Exhibition of Agriculture. Imminence, Blue of the North, the cow of this show, had many visitors: for this 56th edition, 633 213 visitors came on the International Exhibition of Agriculture! The Hauts-de-France area, at the entrance of the Hall of the Regions, honnor the products under official signs of quality, including cooking and fishing demonstrations and local products. The catering and promotion stand once again delighted the visitors who came for lunch, by the quality of the products offered and the welcome given to customers. Some 1460 meals were served in this promoting regional brands Terroirs Hauts-de-France and Saveurs en'Or area, products under signs of quality and iconic products of the region. More and more loyal customers come back to eat there every year. 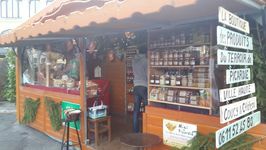 The shop linked to it has also been very successful with a range of products: more than 100 products mainly Terroirs Hauts-de-France and Saveurs en'Or presented. More than 1600 customers took advantage of this beautiful showcase. 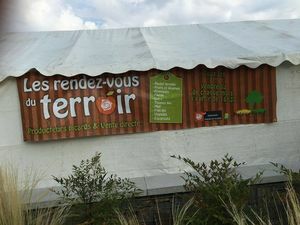 "Bienvenue à la ferme", has brilliantly defended the "Eat Farmer" with a promotional stand that included a food court and takeaway products. Over 800 meals and 240 sandwiches served. 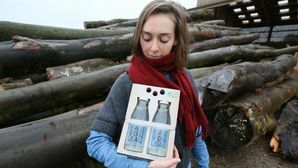 Despite a slight drop in takeaway products, the first French brand for direct sales and sales at the farm responded to visitors' expectations thanks to the involvement of 8 men and women farmers. 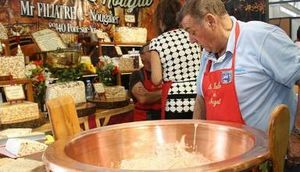 In addition, there were 9 company stands in the region: beers, confectionery, chocolates, canned goods, maroilles and potatoes delighted the taste buds of visitors. You could not come this year? You can always consult the folder of the animations that took place there. See you in 2020 from February 22nd to March 1st! The regional map "Bienvenue à la ferme Hauts-de-France", offers you all this at a glance. Marie-Claire and Marc Desjardins produce spelt from Froyelles in the western Somme. They set up a stone grinding mill on their farm, 1 rue Madame, to turn the grain into flour. They offer different forms adapted to different uses. At the last approval committee, Terroirs Hauts-de-France, they proposed "coquillettes", twists and penne made with their flour. Complete and succulent pasta that the juries have enjoyed. Three new products Terroirs Hauts-de-France! His bees, gathered in 180 hives, produce over the seasons all flowers honey, but also monofloral honey (lime, acacia, chestnut). On Thursday, he presented his various honeys to the Terroirs Hauts-de-France accreditation committee. They have all been certified with grades above 15... this young beekeeper's work is very promising! Congratulations to him! Once again, the Hauts-de-France region proves that it is possible to make excellent honey north of the Seine! 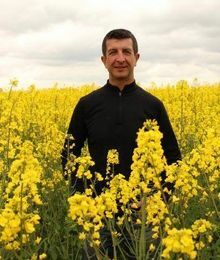 At the last accreditation committee, rapeseed oil and organic linseed oil from Richard Vilbert, a farmer in Rubempre in the Somme, were approved. Since 2009, Richard Vilbert has gradually converted his land into organic production. "The transition from conventional to organic is a long hard work," says Richard, "a belief that comes from the land, the one we hold: just like anybody has a part of peasant in him, every farmer has a part of bio in him! " These two oils are "first cold pressed", pressed on the farm with a screw press that rotates very slowly to better respect the product. Organic rapeseed oil is rich in Omega 3! It participates in the proper functioning of the brain, protects our cells from aging and helps fight against bad cholesterol! Organic Linseed Oil is consumed either in the morning to take a lot of omega 3 (a teaspoon) or in vinaigrette. It must not be heated or cooked. You can put some in the food in the dish or on the plate. Once the bottle is opened, it must be kept in the refrigerator. The Hauts-de-France region will be present along with several companies. Domaine Picard will present its products for the first time to visitors of this show. 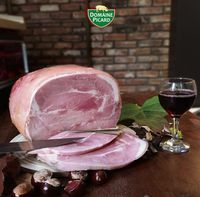 This company, which specializes in the manufacture of charcuterie products, has acquired a solid reputation thanks to original recipes, in particular the "Pâté picard" mixed with a fork at half cooking and its "veined salted" hams. Lyon Sihra Eurexpo from 26 to 30 January, the best of gastronomy will be gathered for this important trade show. Of course, Maison Bayard, goldsmiths of the potato will be there to present its wide range. Yesterday, at a committee of approval varieties rose Lily, Andean sunside (to make mashed potatoes of an extraordinary yellow hue! 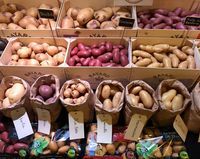 ), Prunelle Blaue St Gallen and Violet Queen (two magnificent varieties of potatoes of a blue deep) have been approved Terroirs Hauts-de-France. Many chefs trust Bayard House, do like them! Maison Bayard is a member of the Culinary College of France, a sign of quality! First day of snow in Hauts-de-France. Fireplaces, wood stoves and stoves will work. Why not feed them with compressed wood logs? In Méricourt-en-Vimeu, Gilles de Poncins values ​​the branches of the hard woods of his forests like that. Logs of compressed wood are energy efficient. Kali logs are practical, do not dirty and last a long time, there are many reasons to use them! Endive, the vegetable "king" of our winters! Since 1953, the Oger family produces it at Noyelles-en-Chaussée in the Somme endive. We all know endive or chicory in the form of a pretty vegetable with white leaves that can be eaten raw in salads or cooked in many forms. But we know that everything begins outside by the culture of the roots which, once put in "forcing" with the black, will give birth to the leaves which we will consume. Finally, we have no idea of ​​the number of human interventions needed to reach the packaging. We must transplant the endives to start the forcing, then "break" the upper part to detach the white leaves, to keep only the beautiful part of the leaves ..... This is why the endive producers participate in maintaining of life in our villages by creating many jobs, not relocatable! I am sure that you will not look at endives in the same way anymore. 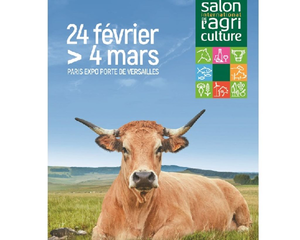 From February 23 to March 3 will be held the International Exhibition of Agriculture at the Parc des Expositions Paris - Porte de Versailles. It is a beautiful "bleue du Nord", which was been chosen as the cow of SIA 2019. Its name is Imminence and comes from Saint-Aubin in the Avesnois-Tiérache. You can see it in Hall 1. The region Hauts-de-France will be present. The main theme chosen this year is: products with official signs of quality. You will discover on the stand PDOs, PGIs, products from organic farming, red labels of our region. The tasting-restoration area will showcase them through cold or hot plates. You can also find them at the shop. Come to discover and enjoy them! Spirulina to strengthen our immune defenses! This morning, it's cold in Hauts-de-France! So, why not strengthen our immune defenses by using a natural product, spirulina? 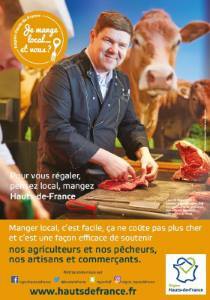 Marc Hossart, farmer in Saint-Léger Authie in the Somme, produces it for you. Spirulina is a 100% natural food that contains more protein than meat, more iron than spinach, more vitamin A than carrots and more calcium than milk. To consume preferably in the morning, associated with a source of vitamin C. According to your physical activity, you can consume 3 to 5 grams per day by starting the cure progressively. 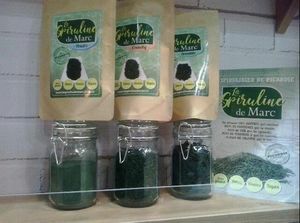 Marc Hossart offers his spirulina in three forms: traditional, crunchy and powdered to make smoothies or integrated into culinary preparations. Share your local recipes and try to win a gourmet basket made in Hauts-de-France! 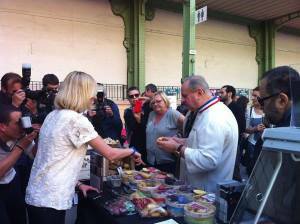 The region Hauts-de-France, first agricultural region of France, is full of tasty products. During the month of January, share your local recipes and try to win a basket made in Hauts-de-France! To promote the great diversity of Hauts-de-France products, the Region proposes to make a recipe from at least two of these three ingredients: Haricots de Soissons or Iingots du Nord, pre-salted lamb from the Bay of Somme and Genever Flandres Artois. Be original and surprise us before January 20, 2019! Put on your apron and fill in the fields below, without forgetting to download the photo of your recipe. From January 20 to 27, 2019, vote for your favorite recipe on our dedicated Facebook photo album. The winner will be announced the following week and will win a gourmet basket of "Produits Saveur en Or" and Terroirs Hauts-de-France. To start the year well, a detox cure is required! During the holiday season, you may have made some excesses ... So to start the year, a detox cure is required! No need for pharmaceuticals, for you, Galiane harvests birch sap every year in its forests. Birch sap will help your liver get back in shape and purify your body. At the rate of 10 cl each morning for 15 days, you will leave on a good basis. You want to offer or eat chocolates and cakes of good quality? At the end of this year, many of you will want to eat or offer quality chocolate and biscuits. Local producers are there to give you complete satisfaction and above all to guarantee the quality and the origin of the productions. So, do not hesitate, make them visit, they are waiting for you! You can also find their products in the Terroirs sales outlets. 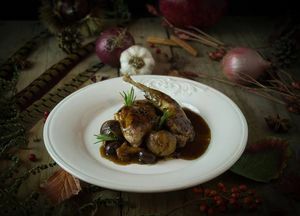 Foie gras and snails: the most popular dishes for the happy festive season. So, to be certain of the origin of the products you will taste, buy them directly from the producers or the Terroirs sales outlets. 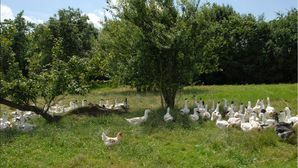 Throughout the year, Fanny and Bertrand Fagot in Condé-en-Brie (Aisne), and Samuel Roeland in Trélou-sur-Marne (Aisne), raise ducks for your pleasure and transform them into succulent preparations. 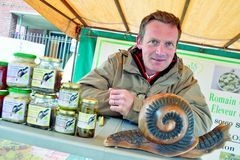 Romain Godefroy, meanwhile, raises snails in Sentelie (Somme), "à la bourguignonne", with spicy oil, in "croquilles", with pudding or cream of garlic, there is something for everyone! 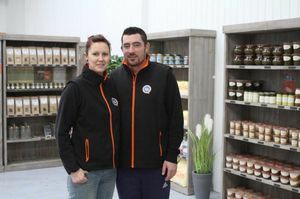 Mr and Mrs Héripré are waiting for you in their new shop in Flers sur noye. Maison Héripré Volailles is an institution in Amiens. Daniel Heripré, the father and Héripré Guillaume prove every day that craftsmen have gold in their hands. The products are always succulent and many of you appreciate them. For your holiday meals, Guillaume Héripré makes delicious products made from local ingredients in his workshop. His inventive spirit is often supported by Daniel. Thus, they have revisited for us the white pudding and we propose the white pudding with the "gâteau battu", a pure delight! 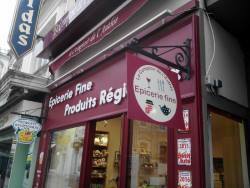 So, opening a shop in Flers sur Noye is a news that will delight many of you. 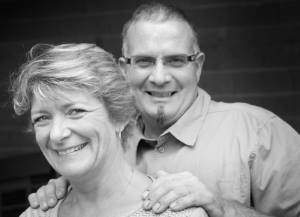 From Wednesday to Sunday morning, Martine and Daniel Héripré will welcome you for your greatest pleasure. The Heréripré House - the Artisan of local products in Flers-sur-Noye will be quickly a key address of the Grand Amienois! 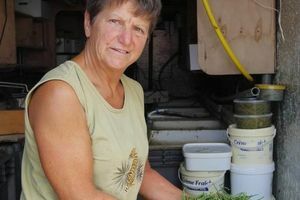 Clotilde Brown-Allavoine has been producing "Fleur sur O" since 2016 within the family farm in Housset, in Thiérache in the Aisne, after having spent ten years in England. 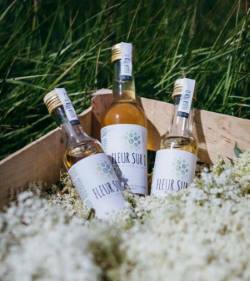 Fleur Sur O is an elderflower syrup, high-quality with a delicate and intensely fresh taste, elaborated by myself using the elderberries of the farm! It is very popular in cooking because it raises simple recipes for festive occasions. She used a producer's laboratory miles away from her home, generating numerous and delicate transports as well as expenses. She has decided to repatriate production on the farm by building a processing laboratory. Her goal is to collect € 10,000 through a crowdfunding campaign to help her to build the processing lab this winter in the arena, where the animals separated the grain from the straw. A building in the heart of the farmhouse, a future beautiful renovation! - A focus on award-winning products at the FoodCreative Food Innovation Competition. 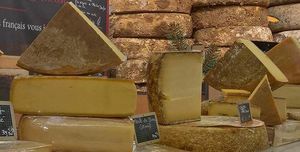 - Dossiers on cheese: An original and dynamic cheese terroir, "Cheese is a matter of education"; Tome with nutty taste; The organic goat "climbs" in the hearts of consumers; Milk is good for growth. - Presentations of products: Wildy Gourmandises (Biscuiterie La Pierre qui tourne), a bottle of milk full of common sense (Lait prospérité), icy tubes for a wave of pleasure (La Glacerie), the apple highlighted (Domaine de Moismont). - Reports: The quinoa seduces the palates of gourmets (Terrasses de Moray). - A nutrition component: squash in all sauces. If you wish to receive this number and the following ones free of charge, please send an email to Anne Halgand - Picardy Products Promotion Committee. 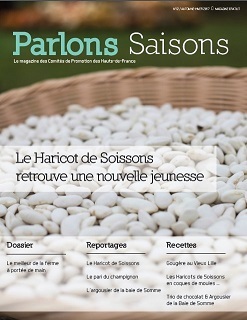 Download the Parlons Saisons #14. "Bienvenue à la Ferme" farmers, they like to share with their visitors the passion for their different jobs. You will be able to discover the animals of the educational farm, have your children make up and a horticulturist will propose you Christmas decorations. I even think that Santa has planned to come and take pictures with the children ..... but it's a secret! Savine Lefevre awaits you from December 1st to December 31st at Saint-Quentin Christmas Village! Village animations for children, cottages will allow you to give end of year gifts to your family and friends. 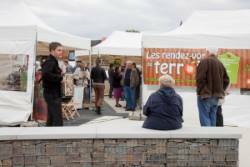 The "boutique des produits du terroir" will be there for all the period. To learn more : www.laboutiquedesproduitsduterroir.com and to know the opening hours of the village. It is an unexpected product in our region: the Fleur de Sel and yet, Xavier Helsmoortel shows us that it is possible. At low tide, Xavier goes to the "Sirène" beach, dominated by the Cap Gris-Nez, to pump sea water. Then, he pours in resin tanks his precious liquid. 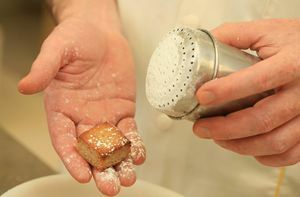 By natural evaporation, he can use a small squeegee and a net to harvest the fleur de sel. Under ideal conditions, it takes about ten days to harvest the salt. Xavier produces different fleurs de sel, four have just received the approval Terroirs Hauts-de-France. - Fleur de sel of 2 Caps with chicory. Recently, Chef Christophe has used the fleur de sel of 2 caps on the occasion of an official dinner given by the President of the Republic as part of commemorations of the centenary of the armistice of the great war alongside Guillaume Gomez, the head chief of the Elysée. A proof of quality! When he decided to create his brewery, Philippe GAGNIARD had three driving forces: to make his passion his job, to become a player in the social and solidarity economy and to participate in the sustainable development of the region of Compiègne. A year and a half later, it is clear that he has won his bets. If you visit him, rue Saint Lazare, you can see it yourself. 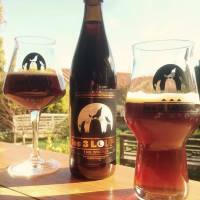 Brewed in Compiègne, the beer is packaged in returnable and reusable bottles in wooden crates made by the staff of a local CAT. Proximity, quality, short circuits, protection of the environment, solidarity jobs, everything is there! You just have to taste the different beers at the brewery or until December 9 in the Christmas cottage on rue Napoléon. The opportunity to taste the warm "cervoise" (barley bear) of Christmas, with a delicious spicy taste. To prepare for the happy festive season, think of the products that you propose to your guests. Why not snails? We are less than a month from Christmas. To prepare for the happy festive season, think of the products that you propose to your guests. Why not snails? In Hauts-de-France and with Romain Godefroy in particular, I eat locally ... and you? Farmer committed to the "Bienvenue à la Ferme" network, Romain will give you the best welcome. In order to prepare the happy festive season, Annie and Bertrand Fagot open the doors of their family farm in Condé en Brie, on December 1st and 2nd. 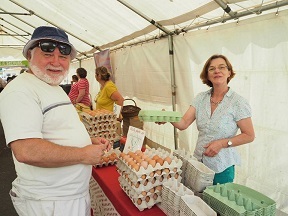 Mas d'Auge: Terroir Hauts-de-France approved outdoor fresh-made eggs are set to conquer the Paris region! Laid in the Oise and Somme by hens raised in the open air, sorted, calibrated and packaged in Montdidier (80) the extra-fresh Mas d'Auge approved Terroirs Hauts-de-France eggs attract more and more consumers. Presented in boxes of 6, 12 or 20, these extra-fresh eggs will allow you to make delicious recipes! Do you want to meet Nicolas Haag in his chocolate world? Come and meet Sunday, November 25, Anne-Sophie and Nicolas Haag Wallet on the occasion of an open day at the workshop (Plachy Buyon). After this visit, the chocolate will have no more secrets for you but above all you will have met passionate and passionate craftsmen! A good way to prepare the festive season! Do not forget that you can find Anne-Sophie every day at the 17 boulevard Faidherbe store in Amiens. These are potatoes selected and packaged by the Bayard company, located in Laucourt, near Roye, which were served with the poultry of Bresse, Sunday, November 11, to 70 heads of state invited to the Élysée. "You imagine ? Seventy heads of state? The President of the United States, the President of Russia ... "
In the Bayard potato packaging and selection company in Laucourt (east of the Somme), pride is immense. Potatoes from this Santerre factory were served as "Élysée molded apples" for breakfast on November 11th. 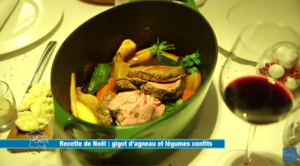 A recipe executed by the Élysée chef, Guillaume Gomez. The Bayard family knew only in the day of Sunday that its potatoes accompanied the poultry from Bresse to the Élysée. "It's the chef himself who informed us," says Françoise Bayard, the director general. This is not the first time that the Santerre tuber is served at the Élysée. Because "in 2015, we became producers and craftsmen of quality. We are sponsored by Eric Briffard, the chef of Georges V, to whom the family business already delivered potatoes. 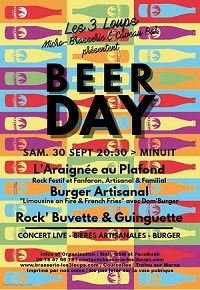 The brewery "Au Coeur du Malt" invites you to participate in its beer festival this Friday, October 19 from 18:30. On the program: Beer, Sauerkraut & festive atmosphere. Ponthoile (Somme), when Anne Poupart had the idea to produce saffron in the Baie de Somme in 2009, many regarded her as an alien. In recent days, the harvest is in full swing and every morning is a real wonder to see all the flowers that hatched during the night. For the saffron harvest, all operations are manual, a real game of patience. The use of saffron is multiple in cooking. It takes very few filaments to achieve them provided you have a quality saffron and know how to use it properly. Anne is not stingy to share her advice on his website. Similarly, you will find many recipes of Anne or those developed by Chefs of our region as Jackie Masse, The Terrace at Fort Mahon, Pascal Lefebvre, The Auberge de la Marine at Crotoy or Sebastien Porquet, The Table of Saltimbanque ... But nothing replaces a visit on the spot, which is why Anne regularly opens the doors of her saffron. A nice idea of ​​outing and discovery. This year's climate was particularly favorable for the production of honeys and in particular the Miel de Tilleul de Picardie (linden honey). It is the emblematic honey of our region. Many professional beekeepers from the Hauts-de-France but also from our region transhipped their hives to let their bees foraging the flowers of the small-leaved limes (Tilia Cordata) which are particularly abundant in our forests, especially in Halatte, Chantilly, Saint -Gobain, Sommoussy. The Miel de Tilleul de Picardie is certainly the most "typed" at the national level. Its fresh flavor exudes mint aromas so much sought after by amateurs. For years, beekeepers in the region want to highlight this product and conduct a valuation approach in collaboration with the Promotion Committee. 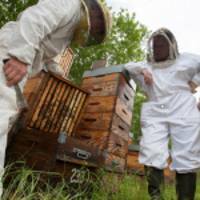 15 beekeepers have deposited, this year, nearly 1200 hives on 25 different browsing locations. Thursday, October 11, was held in Amiens, the tasting and approval committee for the 2018 harvest. It is clear that this is an excellent year. The jury members tasted 19 different samples. 15 honeys were granted the right to wear the Terroirs Hauts-de-France logo. 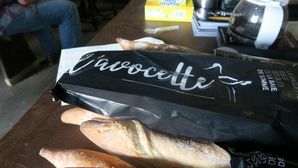 For many years, L'Avocette has been the symbol of co-operation between farmers in Picardie maritime, the two cooperatives that store wheat, the Riquier Mills that produce flour and the artisan bakers who make this baguette of French tradition. The distillery opens its doors for you to discover its craftsmanship during guided tours of one hour and tastings. Brewing, distillation and aging whiskey will soon have no secret for you. Remember to register! 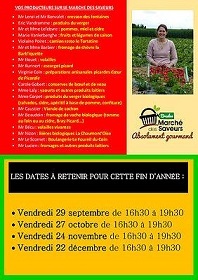 Discover the products of Picardy, exchange with local farmers and find the markets' friendliness. You will appreciate the traceability, the proximity and the flavor of the seasonal products on the "Bienvenue à la ferme market - Terroirs Hauts-de-France" of Villers-Bocage. The producers are waiting for you for a demonstration and a tasting of their products by chef Jean-Michel Descloux! 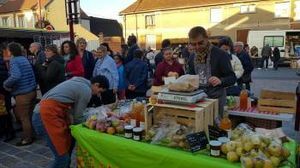 o know more about the Villers Bocage market - To know more about the "EARL de Beauvoir"
The "Rendez-vous du Terroir" takes place Place de la gare from 4:30pm. Like every first Friday of the month, find the local producers who will offer you their best products. In a friendly atmosphere, find Laigneville white and pinked mushrooms, fruits and vegetables, cheeses and eggs, breads and biscuits, snails and many other products. Visit of the brewery, discovery of the manufacturing processes and all that makes the particularities of the different beers. Food truck and DJ Electro Guinguette Saturday evening from 7pm to 1am. In Hauts-de-France and Trélou-sur-Marne in particular, I eat local ... and you? In Thiescourt (Oise), Sunday October 7th from 9am to 5pm. Muriel and Dominique Charpentier meet you at "La Miellerie de la Divette" to help you discover their profession of professional beekeeper. 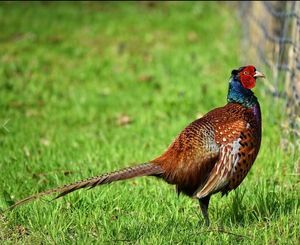 You will be able, if you want it, from 9 am to make a hike of 7 km which will lead you to meet a baker, the Fournil du Bocage, then to a poultry farmer, the poultry of Haut-Bocage. Many activities are available and you can also have lunch on site. On the menu, only local products! Other local producers and craftsmen will offer you their products. A beautiful Sunday in the country in perspective. To learn more about the Miellerie de la Divette. In partnership with E. LECLERC center of Gonesse. The store buys the whole beast and make steaks in the front of the cattle. The breeders of the Oise were present in the store on September 20th, 21st and 22nd. This operation was a great success since the 62 kg of minced meat was sold in just 3 days. This operation is also an opportunity to highlight the work of animation carried out by the sectors alongside the Chambers of Agriculture. 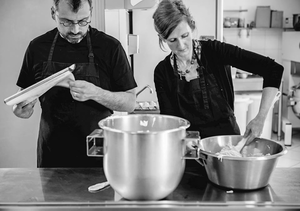 Near Crécy-en-Ponthieu, in Froyelles, Marc and Marie-Claire Desjardins produce spelled that they transform on the farm into flours, without additives or preservatives. Breads, cakes, pizza dough and even "béchamel sauce" work well with the "blé des gaulois". "We want to re-create the beautiful and participate in a chain of good products" says Marc Desjardins, spelled producer in Froyelles, supported by the Departmental Council of the Somme. 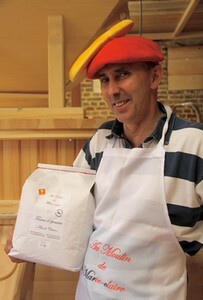 Under the brand "Au moulin de Marie-Claire", we find flour spelled (bise(kiss) or fine), fine semolina, grains and bran. A blend of old and tasty varieties whose hazelnut flavor lends itself to breads as well as pastries ... "
On the program: Visit the cider house, Gourmet Market, Visit the Chapel of Our Lady of the Mount, Barter Plants (Take your plants, exchange and leave with those of the neighbor). Ancient games for children and older children, presence of Apples Crunchers. Bernard Nicolai and his team invite you to discover the production of apples and pears for a day "Vergers et Portes ouvertes" on Saturday, September 22 from 10am to 5pm at the Domaine de Moismont in Vron (Somme). Many surprises await you including the tasting of the famous pie "Monette", apple of love, juice, smoothies, animation Head of Apple will be proposed as well as workshops on insects led by François Lasserre. A day for young and old! In Hauts-de-France and Vron in particular, I eat local products ... and you? We often talk to you about the Bayard Family, the goldsmiths of the potato. Francoise Bayard, Bertrand Bayard, Adele Bayard and Florent Bayard are recognized internationally for the work they do on a daily basis. Today, it is "Météo à la carte" on France 3 TV which pays tribute to them through this superb report. It is one of the emblematic products of the Aisne: the "Haricot de Soissons". It had almost disappeared but thanks to a handful of farmers, the culture was revived in the 2000s. Discover, during this festival all the secrets of the culture and use of this succulent legume. Seeding of the Soissons bean occurs when the frosts are no longer to be feared and the earth is warmed. May Day is the reference date for planting the crop. The saying of the gardener said "beans sown at St Didier, beans full basket ...! ". The Soissons bean is a rustic crop that requires little see no phytosanitary treatments. Producers are close to the environment and promote mechanical weeding. 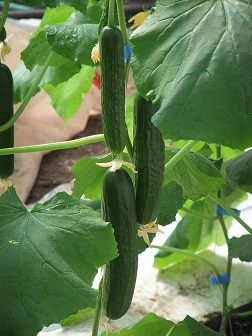 Hilling on the row is recommended when the plant reaches 10 to 20 cm high (the first two leaves spread). Water and heat are key elements in the successful development of this legume. Harvesting is done by hand when the pod is dry and the seed is ripe. The pod is gently unhooked from its stem and then stored in a breast and ventilated place. It takes place between October 1st and November 15th depending on weather conditions and areas to harvest. 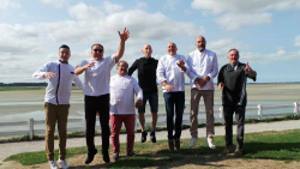 On the occasion of the Gastronomy Festival, the members of the Baie de Somme Zero Carbon Association will meet you at Le Crotoy, Place de la Gare Train Station from 11.30am to 2pm for a local gastronomic event prepared by local Chefs. Local producers will also be present to show you their products. - Christophe Gense and Jean Louis Labry - The star of the day, Olivier Gignon - La Table des Corderies, Dominique Dreuillet - Butcher Charcutier Traiteur, Sébastien Crépy - The gardener's table Argoules, Benoit Varlet - Marquenterre Park, Didier Guilbert and students from the Lycée du Marquenterre. 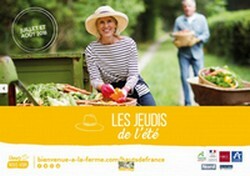 The national network "Bienvenue à la Ferme" launches the "Eat farmer" tour throughout France. Around the van, producers in the region will share a convivial moment with consumers who will discover and taste the products. 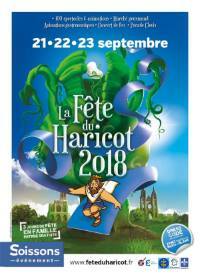 See you on September 25 and 26, 2018, from 10am to 18pm, place Gambetta in Amiens. 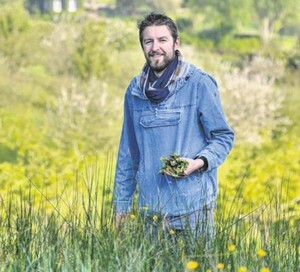 For many years, Sébastien Porquet has proved that cooking with local products is possible, even for a restaurant owner. If logistics remains a problem that is not always easy to solve, it is still feasible. After leaving Saint-Valery-sur-Somme (Restaurant Table Corderies), Sebastien Porquet and his family will write a new page of gastronomy. Thanks to the Vimeu Scout who wrote this article in last week's edition and available on Facebook page of Sébastien. If the place is still confidential, I'm sure we'll be delighted as soon as we discover it. The local producers who used to work with Sebastien Porquet and saw their products sublimate on the plates are already happy, as I, of the creation of this new table! In February, we will discover the places. - Producers of the Baie de Somme market! 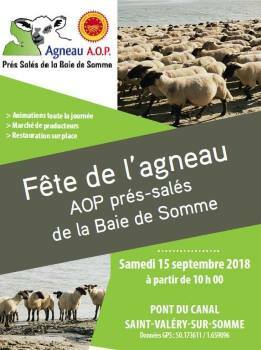 Come and discover the AOP Lamb from the salt marshes of the Baie de Somme and the profession of shepherd. 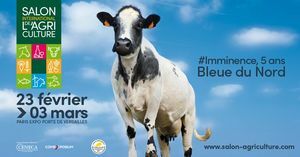 Breeders and producers will be delighted to share with you this 100% Baie de Somme day! Whatch the video presented by Jean-Pierre Pernaut on August 31 on TF1 during the 13-hour diary. 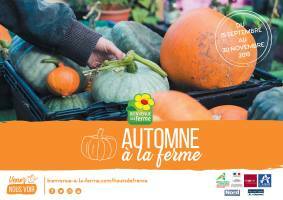 To celebrate the colors of autumn, the products (apples, saffron, pumpkins, heather, ...) and the activities of the season (planting shrubs, ...) farmers of the network "Bienvenue à la ferme" open you their doors and offer you many animations and festivities on their farms from September 15th to November 30th. Come and meet the farmers for a moment of discovery and exchange! 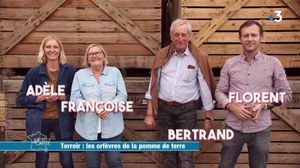 16 farmers of the network "Bienvenue à la ferme" offer many activities, tastings, sharing moments, festivities on their farm, around the discovery of their activities. Saturday, September 9th from 10 am to 6 pm, Paul Héraud and Rémi Mulet open the doors of their farm. Farmers "Bienvenue à la Ferme" they will know how to share their passion for their job! On the program: Presentation of the farm and its breedings (cattle and rabbits), visit of the transformation workshops. On-site catering with only local products. Other producers will be present to make you discover and appreciate their products: Clotilde Brown (elderflower syrup), Marie-Pierre Gruson "Folie Douce de Thièrache", Grégoire Leroux "Clos de la fontaine Hugo"
With its inescapable smell, Maroilles is a flagship product of the Hauts-de-France region. He is even the most famous of the region. 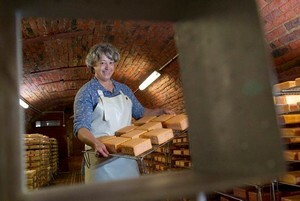 At the Fountain Orion Farm, Claire Halleux produces this cheese which is part of the gastronomic heritage of the region. Every morning, she receives the milk from her cows which she transforms into cheese. Congratulations to all these producers ! 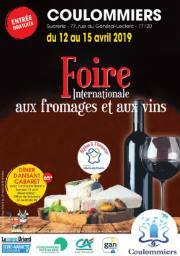 Learn more about the "foire aux fromages"
Gentelles (Somme) a few kilometers east of Amiens towards Roye. 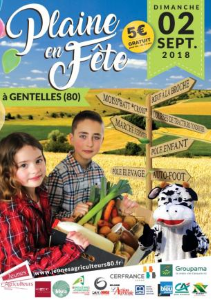 Young Farmers of the Somme are organizing "Plaine en fête" this Sunday from 10:00 to 19:00. The biggest agricultural festival of the department, a day of discovery with animations for young and old. 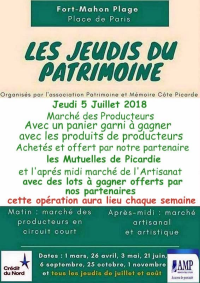 Picardie Venaison will welcome you to make you discover its trade and its products. Specialists in the collection of game for a dozen years, Olivier Dewaele and Marc Agnés have developed many recipes for various products: Wild boar terrine, pheasant terrine with calvados, deer terrine ... but also fresh products. Thus, when you go to the Restaurant Lake Park Asterix are wild boar from Picardy Venaison that you enjoy. 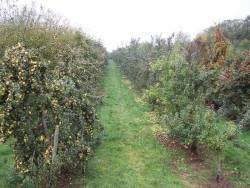 The picking of apples and pears will begin next week, earlier than usual, in the west of the Somme, near Abbeville. The harvest is announced early in Vron. Farmers are therefore looking for seasonal pickers for a period of about two months. Farmer Bernard Nicolaï, who produces apples and pears for chew, as well as juices and fruit purées with those who are "not beautiful", employs 25 people a year. For the picking season, he will recruit 100 more. Consult the Courrier Picard article. 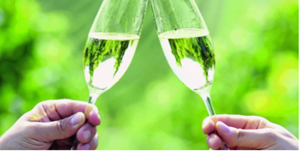 Learn more on the "Domaine de Moismont". The Bayard House recognized as "Goldsmith of the Potato"
As the leading producer of potatoes, Hauts-de-France producers distribute their products both in France and abroad. The Bayard House, located in Laucourt in the Somme, cultivates many varieties and is specialized in varieties sometimes ubile. This House is now recognized as "The goldsmiths of the potato". Their products are on the biggest tables. At the end of summer, the harvests begin. Thus for some days, it is the Ratte du Santerre who are torn off. Adele Bayard: "Ah la la! The Ratte du Santerre and its small calves as much sought, 50% of land in the trailer to harvest! Once sorted, they will be packaged in wooden boxes that will protect them to your table, those of restaurateurs or Michelin-starred Chefs .... "
Pierre Sang (Paris), Johann Lecocq and Pascal Lefebvre (Le Crotoy), Jachy Masse (Fort-Mahon), Guillaume Gomez (Elysee-Paris), Yoann Conte (Veyrier du Lac), Sébastien Porquet (Soon a new address. ...) are among the faithful chefs to sublimate their products for your pleasure. So, you too, invite the Ratte du Santerre to your table! 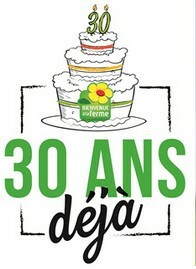 30th anniversary for the "Bievenue à la Ferme" network ! This network serving good taste and simple pleasures is celebrating its 30th anniversary. On this occasion, discover a series of recipes to test around a seasonal product to find in the network of farmers members. Download recipe # 1 "Rainbow Tomato Tartare with Basil Bread"
Download recipe # 2 "The red fruit soup with farmhouse yogurts"
Download resipe # 3 "Asparagus with mimosa"
Do you know the beers of the "Brasserie des 3 Loups"? Located in the heart of the Marne Valley (South of the Aisne), the brasserie "Les 3 Loups" is located on the hamlet of Courcelles, Trélou-sur-Marne. The brewer Sylvain Henriet, craftsman in the soul, after having traveled through France and Belgium in order to quench his thirst for knowledge, returned "to the country" to brew his beers, fruit of his journey and his love for the drink. 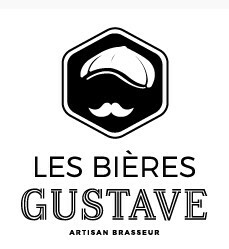 The brewery produces beers of Belgian inspiration, light, subtly spiced and finely hopped, but over the course of his meetings and travels, Sylvain initiated new recipes and experiences while applying the same know-how and the same requirement. White, Blonde, Amber, Triple, IPA, Extra-Stout .... there's something for everyone! The brewery and its cellar are open every Saturday for tasting and sales from 3pm to 6:30 pm. Events are regularly organized at the brewery. 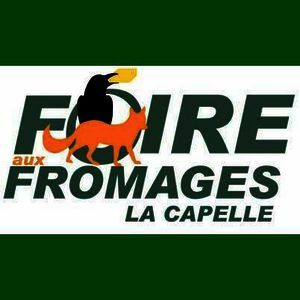 A few beers from the Brasserie des 3 loups will be offered on the Terroirs Hauts-de-France / Regional Council stand at the Cheese Fair in La Capelle on September 1st, 2nd and 3rd. Are you a beneficiary of RSA and looking for a job? Wine growers need labor for the harvest! The Department is putting in place an exceptional system which allows to work without loss of the RSA benefits. Contact "Pôle emploi" now ! For many years, the collectors of the Baie de Somme have organized themselves to preserve their craft. After having obtained a diploma, the State granted them a concession in Baie de Somme on which they practice their activity. In order to favor the natural growth of the salicornias, they fight against the spartine (which retains the sand and smothers the salicornias) while carrying out harrowing work on the moliers. Thanks to their valor, their mobilization and their determination, they have given letters of nobility to the Salicornes of the Baie de Somme and other marine plants. Professional buyers are not mistaken, they say that those of the Bay of Somme are the best in the world ... without chauvinism since the biggest buyer is Dutch! 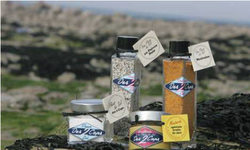 So, when you buy salicornia growers look closely at the provenance and prefer the Salicorne Bay Somme and processed products highlighting the origin Baie de Somme! If you see the Terroirs de Picardie / Terroirs Hauts-de-France logo, you are certain that the salicornia winters come from us! MThanks to the Courrier-Picard newspaper for this article and to Reinette for his commitment! Remember that we, producers and consumers are all actors in our food! 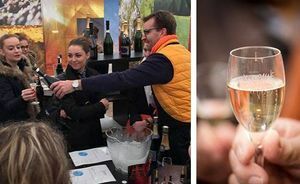 A must-attend event for the start of the agricultural season in the Aisne region, the Capelle fair brings together a large number of producers from our region and winemakers from many French regions. Come and visit us in the Michel Flandre Halle on the stand of the Regional Council. We will show you many products and in particular Fleur sur O, the elder syrup made by Clotilde Brown-Allavoine in Houssaye in Aisne. 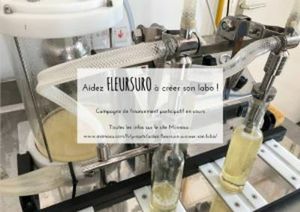 In the Espace du Terroir, Marie-Pierre Gruson-Ferdinand Lapersonne will be waiting for you to taste the "Folies douce" from Thiérache, Paul Heraud, his rabbit-based products and Grégoire Leroux his ciders, apple juice, jellies and vinegar .. .. 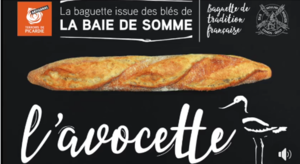 The "Avocette", the traditional French "baguette" made from cereals from Picardie maritime! You have been numerous for years to appreciate the avocette (nature or seeds), you always asked us where to buy it ... well now it's simple, just check the map to find your nearest baker. Farmers, grain storage organizations, millers and bakers have joined forces to set up a sector in which everyone puts their work at the service of a collective goal: to offer consumers a "baguette" of local French tradition. The Moulin Riquier, located in Cahon-Gouy near Abbeville in the Somme, the last mill in activity in the department, crushes the wheat grown in Picardy maritime and delivers it to the bakers engaged in this sector. In Hauts-de-France and in Picardie Maritime in particular, I eat locally ... and you? The « Biscuits Mademoiselle » is Sandra and Mathieu’s crazy adventure. They are two passionate (and greedy! ), craftsmen’ grandson and granddaughter. They grew up with the taste of authentic products and well done job. In 2014, they take up the challenging of creating an artisanal bakery where would be made, more than biscuits ... emotions! Where each shortbread would be carefully hand-made in a high-fashion spirit. The challenge was taken up in 2015 the shortbread ready to be crunched was born. A varied collection of 9 cookies with real personality, subtle and delicate flavors. 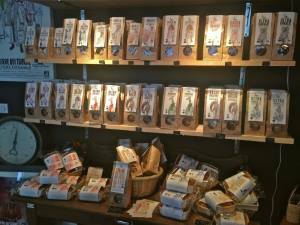 The « Biscuits Mademoiselle » is a unique artisanal bakery with authentic flavors from local products located in Saint-Quentin in the Aisne. Sandra and Mathieu have chosen to find quality local partners to provide them with the main raw materials. They buy the flour at Moulins Hoche in Rozet Saint Albin in the Aisne, eggs at Tronquoy Farm in Lesdins a few kilometers from Saint-Quentin and butter at Maison Lebeau, a small company located in the heart of the Avesnois at Louvignies-Quesnoy in the North. Cookies with evocative names: "My Beloved", "My Good Lover", "The Cavalier", "the Romantic" and "the Brussels" have just been approved by Terroirs Hauts-de-France "Artisanal"
In Hauts-de-France and Saint-Quentin in particular, I eat locally ... and you? Is it possible to make spread with faba beans? Of course! that's what Beatrice Maire has managed to do to offer us succulent spreads. 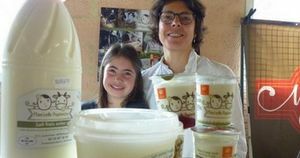 Located in Beuvraignes, a few kilometers from Roye, in the Somme, she has developed an innovative product (she has filed the patent) which is the first spread without any added fat. 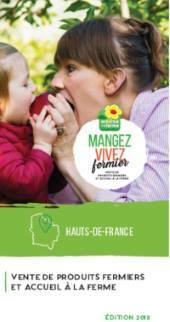 With this product, Béatrice Maire was also laureate last June, of Prot'eat contest which aimed to develop the consumption of protein crops in France. Yesterday,the members of the Terroirs Hauts-de-France accreditation committee were seduced by the faba bean cream but also by the Tartimouss range. In all preparations, the main ingredient is faba bean to which Beatrice adds sugar, chocolate (black or milk) and then hazelnuts or cognac, candied oranges, rose water, ginger ... .
From now on, Béatrice Maire's products will proudly display the Terroirs Hauts-de-France "Artisanal" logo. When you have tasted Tartimouss, no doubt you will adopt it! Moreover, this delicious spread is full of nutritional qualities. It represents only 310 calories per 100 grams, compared to 550 calories for conventional spreads. In Hauts-de-France and Beuvraignes in particular, I eat locally ... and you? Settled in Grémévillers in the Oise, Anselme and Etienne Beaudoin have for many years produced Rollot, Tommes with hay and cider and Brays Picards from the milk of cows of their herd. In order to offer new taste pleasures, Anselme worked on the production of a "blue type" cheese. Well, it's a success. The "Crévecoeur" combines the power of blue marbled with the sweetness of a cheese made with milk of cow. On a plate, in a salad or even better in an omelette, I'm sure that the "Crévecoeur" will quickly conceal you. This cheese won a silver medal at the last local produce competition in La Capelle, a sign! Another cheese was presented during the approval committee: "The Smoked Cloitre" and a specialty "La Choquoise" a rollot cream particularly useful for culinary preparations or roasted sandwiches. Products to discover without delay! Enrolled in the approach Welcome to the farm, Anselme and Etienne Beaudoin regularly open the doors of their farm. In Hauts-de-France and Pays de Bray especially, I eat locally ... and you? 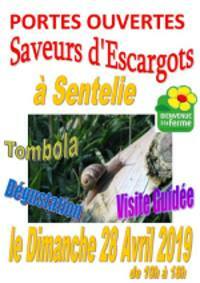 Many of you will visit the Picardy coast during these next weeks. It will be an opportunity to see the "fishermen on foot" carry out their harvesting work daily. 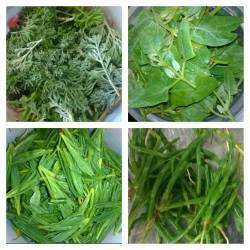 Salicornes, sea asters, sea soda and obione are the best known of these marine plants to be tasted. Many chefs propose them in their card, do not miss to taste them! 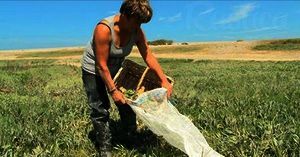 Of course, many fishermen make direct sales in front of their house, so do not be surprised if you see small signs saying Passe-Pierre ou Oreilles de cochons ... they are the local names of the samphire and asters and the most commonly tasted. Enjoy the season to taste these wild marine plants and all the micro-nutrients they contain! 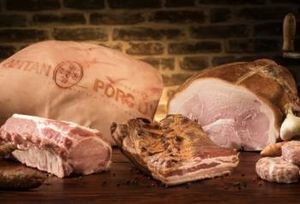 The "Porc d'Antan" pork meat, raised on straw, fed with farm cereals and flaxseed, awaits you at pork butchers in our region. Since almost fifteen years, breeders decided to raise pigs in a different way to provide you a high quality meat. Butchers and pork butchers made no mistake and there are many to offer you meat but also charcuterie prepared from this meat. With the next beautiful summer evenings, think of "Porc D'Antan" pork meat. For example, the Maison Daniel Heripre in Amiens has been producing charcuterie for years with only Porc d'Antan pork meat. Thank you to him for the great photos he allows us to use. Located at 10, Boulevard de la République, open from Monday to Saturday from 9:00 to 7:00 pm (03 22 28 34 08) this place created by Julie Depoilly and Guillaume Delgove wants to be the shortest way between producers and consumers. Fruits, vegetables, meat, sausages, herbal teas ... The managers of Locavrac have chosen to bet on local places to fill their stalls. The store also offers natural cosmetics and cleaning products. Open since the beginning of the year, the store has quickly conquered the consumers concerned about their food and defenders of local productions. The store also offers a range of bulk products: rice, pasta, dried fruit or cereals sold without packaging: everyone can come with their own container. So, no doubt, a visit is required and as an advertisement said it a few years ago Locavrac: to try it is to adopt it! In Hauts-de-France and Abbeville, in particular, I eat local products .... and you? During summer, the "Bienvenue à la Ferme" farms open their doors on Thursdays. Summer is coming, it feels like holidays or small breaks in the sun. On summer Thursdays, the "Bienvenue à la Ferme" farmers network offer tours, animations and tastings in their farms. Enjoy summer Thursdays to come to the countryside and find the link with the farm. In July and August, 16 "Bienvenue à la Ferme" farmers open their doors for a summer activity. - we feed together the animals of the farm, we discover the secrets of the Champagne vine, we taste good farm products. - we follow the work of the farm, we get lost in a labyrinth maize, we go hiking, we learn the secrets of different wools. - we learn about the manufacture of products, we do our shopping market in the farm. Every Thursday morning in July and August, find many local producers at the "Farmer's Market"
Every week, a basket filled with regional products to win! Farmers market in short circuit in the morning, and craft market in the afternoon. 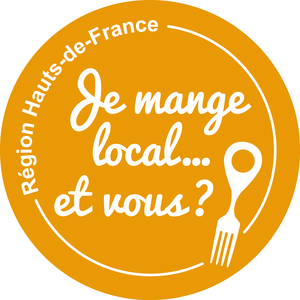 In Hauts-de-France and Fort-Mahon, in particular, I eat locally ... and you? 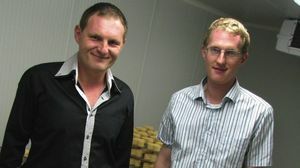 The Rollot, Tomme and Petit noyonnais of the brothers' Defossé have more and more followers. Four employees are now able to meet the growing demands. At the Moulin farm, holidays do not exist. The Defossé cheese dairy supplies not only communities, central kitchens and restaurants, but its products have also invaded supermarkets and hypermarkets. If it reigns on Picardy and even provides large communities in the Paris region, it is also possible to enjoy the direct sale on the farm. 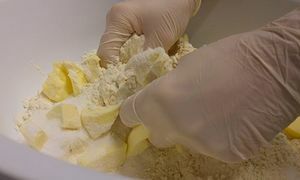 The recipe has even grown: "The cheese dairy building was enlarged at the beginning of the year to separate the different work and storage areas," says Marie, an employee. This cheese dairy allows to transform part of the milk produced on the farm, about 300 000 liters per year. The production has diversified since several years: butter, cream, cottage cheese, yogurt, but also cheese. The Petit Noyonnais, the rollot and the tomme with fenugreek - a seed perfuming tomme with a small taste of nuts - have more and more regulars. This Guiscard farm has existed since eight generations. François and Thomas Défossé took over the exploitation following their parents in 2008. François then decided to add a cheese dairy after his studies in the Jura. In addition to the two brothers, four people are employed at the cheese dairy and one at the farm. The breeding has nearly 80 dairy cows and 80 heifers, Montbéliardes in majority, having replaced the Holsteins over the years. They benefit from thirty hectares of pastures around the farm. The family farm also has 30 hectares for livestock feed and 80 hectares of sales culture. "The color of the crust is natural"
It is in this context that were born the only cheese from Noyon. As soon as milk is received, the manufacturing starts in the morning, following different steps depending on the product. For cottage cheese and Petit Noyonnais, the curd must rest for 24 hours. For rollot and tomme, the production starts after two hours. The maturation in cellar begins. For the Petit Noyonnais, created in 2012, it lasts about ten days, with a passage of eight minutes in a brine bath. For tommes, ripening lasts for at least two months. They are rubbed with salt water twice a week. 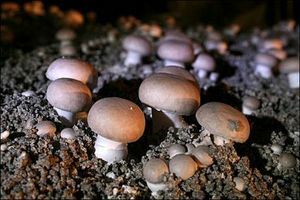 As for the rollot, if the ripening is shorter (four weeks), it undergoes the same technique of salting. Marie says: "The color of the crust is natural." Yoghurt production requires about 500 liters of milk each morning. For their preparation, a new machine was bought. It allows to manufacture and package more than 2,000 pots per hour. The milk is heated for ten minutes and then cooled before the addition of a ferment. After a quarter of an hour, the potting takes place, then the oven drying at 45 ° C during four or five hours, it is an important step since it allows gelation. Yogurts are offered either plain or with fruits. The two brothers and associates don't want to change the formula: "It has always been our desire to manage everything by ourselves". "Fleur sur O" (Flower on O), a cure for thirst! The heat will become more intense. we will have to refresh. 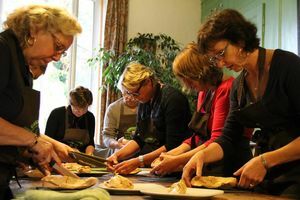 Clotilde Brown Allavoine has gathered for you elderflowers to allow you to prepare succulent drinks. Added with still or sparkling water, or even white wine or champagne, the "Fleur sur O" syrup will brighten your summer. In the house Gratiot-Delugny everything is done from A to Z .... from the cultivation of the vine to the development of various cuvées of Champagne. Next weekend, the doors of this champagne house will be open to you. Thus, you will be able to discern everything about the champage but also the ratafia. An opportunity not to be missed ! Schedules on the website. Of course, the best drinks are consumed in moderation. There are birthdays not to be missed under any circumstances. 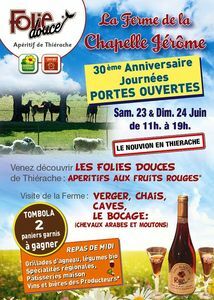 Marie Pierre Gruson and Ferdinand Lapersonne invite you to come and celebrate the 30th anniversary of "Folie douce de Thiérache"
"Sweet madness Thiérache" through various cuvées offer you "fruit wines" typical of this region. These are assemblages of various red fruits (blackcurrant, strawberries, currants, gooseberries ...) then worked as wines. Appetizers to discover absolutely, they will remind you those prepared by our grandparents. Marie Pierre will explain all the manufacturing and I am sure you will come out delighted this day! Then everyone at NOUVION EN THIERACHE (Aisne), June 23 and 24 from 11 am to 7 pm. Marie-Claire and Marc Desjardins produce on their farm spelled, the cereal of the Gauls. 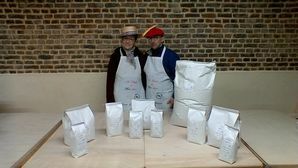 Poor in gluten, this cereal with many property which you will be able to discover Monday, June 18 from 14 to 18 h.
Marie-Claire and Marc open the doors of their farm and the mill ... a visit not to be missed! Thirty bakeries of the Somme offer the avocette, baguette issued from maritime Picardie wheat. A homemade baguette made from wheat produced, stored and crushed in Picardie maritime, in the only mill of the Somme, sold in Picardy maritime and in neighboring cantons: that's the avocet. 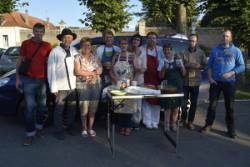 On Wednesday, June 6th, the 14th general meeting of the association of the same name was held at the mill in question, the Riquier establishments, in Cahon, near Abbeville. The adventure began in 2004, when farmers, bakers, millers and co-ops (Calypso and Noriap) joined forces in this adventure "from seed to plate", as summarized by Patricia Poupart, Regional Councilor. . In 2017, thirty bakeries offered avocet. 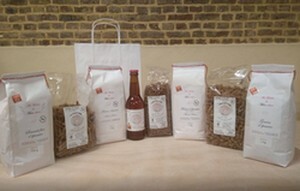 "Since 2016, avocet is made from two varieties of wheat, Camp-Rémy and Apache," said Christian Lesenne, consulting engineer at the Chamber of Agriculture of the Somme, made available by the latter in as host of the association chaired by Hervé Denamps, farmer. "It was after the catastrophic harvest of 2016: there was not enough wheat Camp-Rémy, the traditional variety of avocet. The contribution of this new variety, which did not change anything to taste, makes the bakers present, and a better harvest last summer made more chopsticks: in 2017, 334,000 avocets were produced, which means that represents 25,000 baguettes per hectare of wheat grown, 905 quintals of wheat and 696 quintals of flour. In 2016, the "rotten" year, avocet production had mobilized only 604 quintals of wheat and 465 quintals of flour. As for the selling price, each baker is free to fix it. At the other end of the chain, the tonne of wheat cost, in 2017, 168 euros for Apache and 188 euros for Camp-Rémy, and the quintal (100 kg) of flour, 73 euros. "This year, we will continue with both varieties," said Christian Lesenne, to smooth the consequences of possible bad harvests. The means to develop avocet are limited, for two main reasons: the competition of millers (30 share the bakery market of the Somme), the decrease in the number of bakeries in the department (currently, 200). To this is added a relatively small means of communication for the association. President Hervé Denamps reminded that bakers members had to make a simple effort: "It is not normal to see some sell the avocet in the bag of another brand. It's counterproductive, while 500 packets are delivered with every quintal of flour. " And it's a shame, because the baker has produced a baguette from sustainable agriculture, synonymous with a certain quality, fermented for more than twelve hours without adding activators, without fully promoting it. Drinking water from birches has become trendy. Galiane de Poncins, which created three years ago EauBouLeau reaping the fruits of this success and intends to expand its production in 2018. Three years already, that the birch sap flows in Méricourt-en-Vimeu, near Poix-de-Picardie. Initially, the company set up by Galiane de Poncins was simply trying to use the birches that were not used by his father's logging operations. The idea was to create an organic beverage, with phytotherapeutic virtues, from the sap of this tree that does not fit the criteria of firewood. And since its creation in 2015, EauBouLeau has grown well. So much so that 2018 will mark a turning point for sap harvesting and production. There will be something new, according to the 28-year-old producer. "Since the very first harvest in March 2015, we only use birch sap from our site in Méricourt-en-Vimeu. 2018 will be an important year for us. The biggest novelty we will put in place is to use other forest sites than ours, "she says. Galiane de Poncins has approached forest owners in the region and France with the idea of ? ?reaching 50,000 liters of sap harvested for its birch water. Thus, sites based in particular in the Marne will participate in the development of the final product. "Birch is a resource completely untapped by the majority of French owners. They use every possible plan to manage their farm but birches are often left out. EauBouLeau will change DNA and participate in the regeneration of the French forest. She said. The last innovation of the year 2018 desired by the sylviculturist will concern small bottles of flavored birch water. "I want to launch infusions of birch water herbal to get out of the health and cure aspect. So that people also buy the product for the pleasure of drinking birch water." Change, there will also be at the logistical level. Completed live deliveries for Galiane de Poncins. Since the end of 2017, she has decided to delegate the delivery of her bottles of sap. She is now using two distributors and looking for a third who delivers organic. The packaging of its bottles has also changed over time. It is now made with less cardboard and is more in line with the desire of end customers who advocate organic and respect for the environment. A lawyer specializing in labor law training and mom since March 2017, Galiane de Poncins is now fully dedicated to his company. Thanks to it, the sap is not about to stop flowing in the Bresle Valley. Sap crops have experienced an impressive progressive evolution in 3 years of existence. 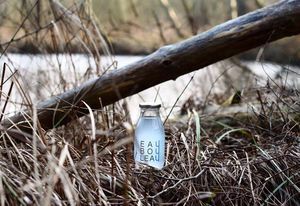 Since 2015, date of creation of the detox drink, they have been muiltipliées by 4.6 liters. The goal is to reach 50,000 liters of sap for the 2018 harvest. Very soon, an Android application, of the same name as the product, will go in this direction and will draw the birches. Using a flashcode, it will be possible to locate the birch of the vintage. A dream for Galiane de Poncins who is eager to "drink a bottle of EauBouLeau and know which tree the sap comes from and what is the day of the harvest." 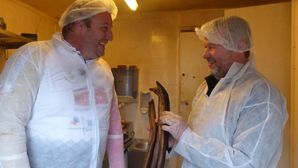 Denis Boulanger, owner of the eel smoker, reveals some secrets of the factory. Perhaps you have already had the chance, the happiness, to go taste the kitchen of Christian Le Squer, great chef of the restaurant "Le V", at the Georges V palace in Paris, classified 3 stars in the Michelin Guide, five toques with Gault and Millau. Perhaps you had the chance, the happiness, to taste the kitchen of Éric Frechon (born in Corbie), great chef of the restaurant "Epicure", at the palace Le Bristol in Paris, classified 3 stars in the Guide Michelin and four toques with Gault and Millau. The relationship between these two great leaders? They are clients of the Saint-Christ-Briost smokehouse, specializing in eels and smoked trout. At the controls, Denis Boulanger. "I am from a family of fishmongers in Haute-Somme, I have been a fisherman since 1980 and eel smoker since 1989". Soon 30 years of work and experience that make him a specialist in fish smoking. "Here I smoke about two-thirds of eels and one-third of trout, which is done in three stages: evisceration and preparation, smoking and packaging." First step, the eels arrive alive from the Loire or the Netherlands. "Since 2006 and PCB pollution, we are not allowed to market eels raised in the Haute-Somme. But we are hopeful that this ban will be lifted by the end of the year, "says Denis Boulanger, who kills fish, removes viscera and emptiness, before salting them. They are then skewered and installed vertically in a smokehouse, over a fire. There, begins the second stage. "It takes a soft wood, to have a bright fire and good coals, then covered with beech sawdust, which gives a finer taste and a specific color". The operation lasts 5 hours, including 3 hours on soot, at a temperature ranging between 80 and 90ºC. Once smoking is complete, they are packaged for sale to the customer. "I can prepare them, or not, it's on demand. Once out of the refrigerator, just remove the skin, which leaves all alone and reveals the flesh. 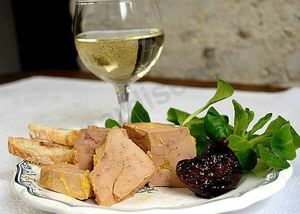 A delicious meat that makes the happiness of great cooks who do not hesitate to marry the product with, for example, foie gras. "Before, the eel was the dish of the poor, we ate often with potatoes. Today, with the scarcity of the product, it is sought after, highly sought after and prices have increased. It becomes a product used by the greatest chefs. Like the smoked eel of the Somme, bread burnt and reduction of grape juice or the eel sautéed meunière with the muslin cress Éric Frechon. On the menu of the restaurant "Le V" in Paris, you can read "Anguille smoke of the Somme, bread burnt and reduction of grape juice", dish created by Christian Le Squer, rated 3 stars in the Michelin Guide and 5 toques Gault and Millau. The maximum. "I always kept in mouth the taste of a Bordeaux lamprey that was done when I worked at Jacques le Divillec (another great chef). One day, I wanted to work on eels. I had a kitchen clerk, who lived in the Somme, who told me he knew a small producer of smoked eels. I came to taste them and I thought. How can we recapture memories of this dish on the lamprey with an eel? When you put on a reduction Chinon, it comes to calm slightly the taste of the smell of eel. It allows to have a composition between the bread, the eel and the wine lees which is coherent. I added a small potato stuffed with a horseradish cream. All this gives a powerful structure. - Dossiers: All in salt, the medals collected at the general agricultural competition 2018. 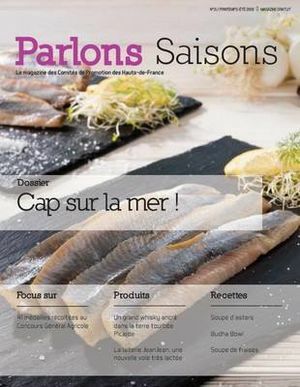 - Product presentations: Marine plants in the Somme Bay (Somme), sweet herring smoked in the old (North), whiskey Hautefeuille distillery (Somme), JeanJean dairy (North). - Reports: The seasonal delicacies of the Ferme du Chassy (Oise). - A nutrition component: The fish, star of the Mediterranean diet. Download the Parlons Saisons #13. Fanny and Bertrand Fagot have been raising ducks for years to offer you delicious products. Magrets, confit, foie gras and many other specialties. Take advantage of these two days to discover everything about raising ducks and farm processing. Saturday and Sunday you will also find many other producers and artisans in the region. We still have some places, remember to book ..! (* Drinks not included, available on the stands of producers). Saturday, May 26 from 2 to 6 pm and Sunday, May 27 from 10 am to 6 pm - Open Days at the Leguillette Romelot Champagne House. Sunday from 12 pm large country meal (reservation recommended). Champagne is consumed in moderation. Add value to your innovations and participate in the FOODCREATIV contest! Who can apply? 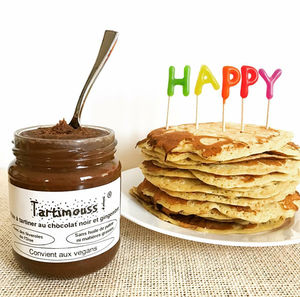 Companies and producers from Hauts-de-France who have developed a new food product or related service, launched after October 2016. Registration on foodcreativ.fr before April 20, 2018. A jury of experts will meet in June and will determine four winners. A sustainable innovation prize, initiated by Agroé, will be selected by a sustainable development jury. In September, a prize-giving day will be organized in the presence of professionals, institutions and the press. 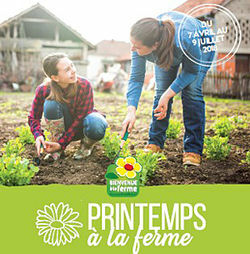 Every year, every week-end from April to June, the farmers of the "Bienvenue à la ferme" network offer many activities and festivities on their farms. Thus, with the blossoming of the first buds, you will be able to celebrate the arrival of the beautiful days in the Spring "Bienvenue à le ferme" and its open days. Come and meet the farmers during an educational and festive moment! 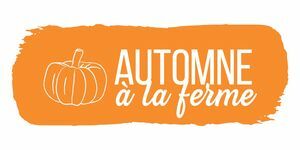 From April 7th to July 9th, 43 farmers of the "Bienvenue à la ferme" network offer many activities, tastings, sharing moments, festivities on their farm, around the discovery of their activities. ... tastings for the most greedy. Poultry, rabbits, porks, cattle, lambs… The Hauts-de-France have many animal breeds, bred by enthusiastic producers. If you choose to consume meat from the Hauts-de-France, you act for our environment and our landscapes, you promote quality and healthy products at the right price. And you are sure to find the real taste of meat. 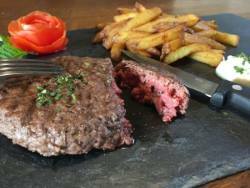 We have definitely all a reason to like meat from the Hauts-de-France ! - and finally the drinks sector. We will show you little by little the animations as and when the implementation of the precise calendar of these. Learn more. 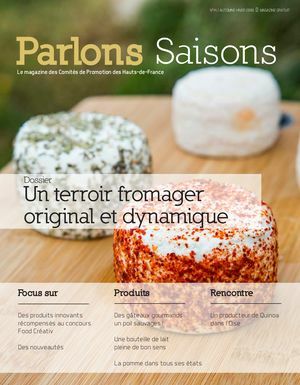 Discover the new issue of the magazine from the Hauts-de-France promotion committee with topics, reports, recipes...to highlight the products from our regions. The pancakes kings will be this year filled with beans created for the occasion. They illustrate for most of the events of 1918. You can find them in Ailly-sur-Noye in the House of Van de Moortele, Albert in the Catoire House, Amiens in Mulhauser and Vandamme Houses, Corbie in Langlet House, Salouel in Maison Hébert. The fabophiles (bean collectors) will still be numerous to want to own them. Alain Langlet, the pastry chef of Corbie, at the initiative of the creation of these commemorative beans, is willing, as the other years, to give or to send to collectors. To contact him: l.alain@wanadoo.fr or at the bakery 03 22 48 40 28. The beans will be sold at a price of 2.5 € each. For Christmas, of course you can offer candies from large companies .... But, you can also go to passionate professionals who are constantly elaborating new products for your enjoyment! 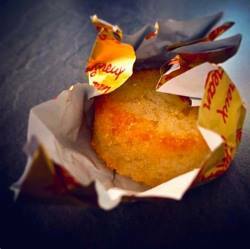 In Amiens and St Quentin, Arras and Lille, Trogneux's offers you its "tuiles" (kind of biscuit) and macaroons. In Amiens and Plachy-Buyon (80), Nicolas Haag prepares macaroons, "tuiles", fruit jellies and his famous "Sweets of Hortillons". This is the final stretch ... for last-minute gifts ... think of the Relais Terroirs Hauts-de-France! We are in the final stretch before Christmas. Once again, you are missing some gifts .... Whether you are in the Aisne, the Oise, the Somme or in Berck sur mer, there is a Relais Terroirs Hauts-de-France near you to offer local products that will please your family or friends! 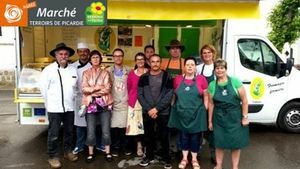 Jérôme, Virginie, Savine, Frederic, Mylène, Lydia, Vréni, Justine and all the others, by the links which unite them to the producers will make you share their passion for local products. In the Hauts-de-France, I eat local ... and you? Plan your Christmas firelogs in compressed wood of course! 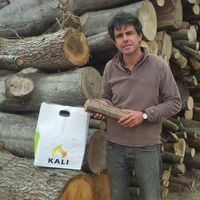 Produced in our region in Méricourt en Vimeu in the Somme from hardwoods, Kali firelogs will enchant your evenings! Space saving, cleanliness, heating time and ease of supply, these are the main qualities of Kali firelogs. Thanks to its very low moisture content (around 8%) KALI has a heating value 3 to 4 times higher than that of traditional wood. KALI produces a durable and stable heat. KALI is manufactured without any additives from crushed and densified wood chips at very high pressure. KALI has perfect combustion and produces virtually no ashes. KALI firelog pollutes much less than traditional firewood. Do not store your firewood anymore! have a free delivery in 24h! An original gift idea for Christmas: learn to brew a beer to your taste. 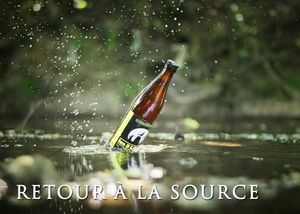 This is what the Ecol'Aux Mousses brewery offers you in Compiègne in the Oise. Accompanied by a professional, prepare and produce 20 liters of beer according to a personal recipe by giving free rein to your imagination or by inspiring you with your favorite beers. During this initiation, after a theoretical part, you will practice your desires in a brewing workshop made for you. 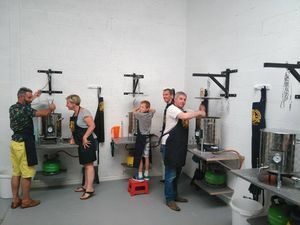 Registration to this fun and tasty workshop allows you to come with two people without any additional cost, to brew 20 liters of beer that you will recover a few weeks later. It is a dish that is often prepared for the Easter holidays but why not offer it to your guests for Christmas? Especially in our region we have two sources of supply: The Baie de Somme and its "pre-salt" sector but also many sheep farmers in the Oise and Aisne particularly. Thanks to Sebastien Porquet, Head of the Table Corderies in Saint-Valery sur Somme for the recipe he made for the show "Météo à la carte". Enjoy and happy holidays! Game for the end of year holidays ... Why not! You are certainly starting to wonder what you are going to prepare for your family and friends for Christmas meal. Why not make them discover game meat. Recipes are numerous and can be prepared in advance or at the last moment. A company based in Compiègne has been collecting wild game meat from our region for many years. Saturday, December 16, 2017 from 9am to 7pm, at the "Ferme des 4 saisons" - 597 rue de Beauvais - 60710 Chevrières. Come and discover the charms of a Christmas market on the farm. A family friendly day in the midst of animals. Many local producers and artisans present. Catering possible on the spot (midday and evening) or take away, on reservation: 06 23 80 94 75. Come all. 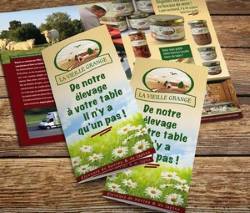 In Hauts-de-France, agritourism activities are numerous and sometimes unknown. 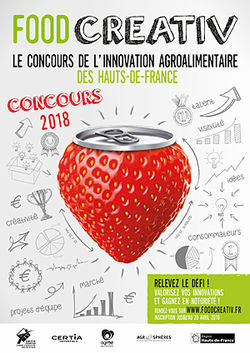 This competition, organized by the Chambers of Agriculture of Hauts-de-France, aims to highlight the wealth of these agritourism offers to meet the new expectations of visitors and to communicate on the dynamism of this sector. the region. Many partners have joined this competition to reward the most innovative initiatives. 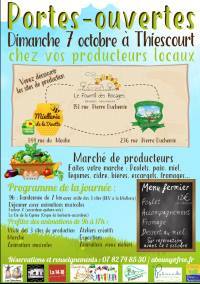 Farmers of the Hauts-de-France, participate by highlighting the actions you lead or the projects being finalized! 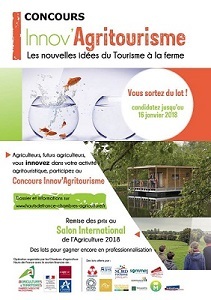 High school students and students of agricultural or tourist establishments compete in the category "Project seed"
From the 9th of December to the 7th of January, meet Savine Lefevre at the Christmas Village of Saint-Quentin in the Aisne. 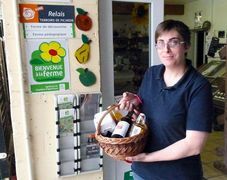 For a few weeks, Savine is going to leave her shop in Coucy-le-Château to put at your disposal many local products that she has selected for you. Real ambassador of products (Do not forget that she owned for a very long time a Hotel-restaurant in Coucy) and producers, she will perfectly guide you in your research and your choices. Then go to his cottage on the square of the town hall of Saint-Quentin and enjoy all the events offered by the town hall for your enjoyment. Learn more. The regional brand "Terroirs de Picardie" is part of the new regional dynamic by changing its name and logo. - the control by an external certifying body which guarantees consumers compliance with the specifications by the producers. We know that you will postpone the trust you have placed in "Terroirs de Picardie" for years with this new "Terroirs Hauts-de-France" brand now open to farmers, artisans and companies from the five departments of our region. It's time... the Christmas markets are opening their doors. In Reims, from November 23 to December 27. 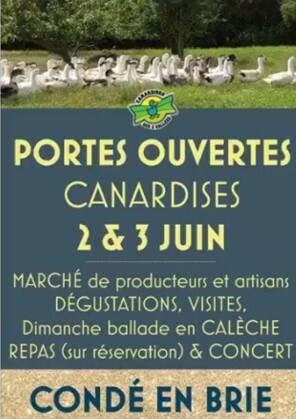 Products from the south of the Aisne will be presented at the "Canardises des Trois Vallées" of Condé-en-Brie which will have their own cottage. Located on the left wing of the Cathedral and the beautiful "Angel with a smile") the cottage n ° 29 offers you direct from the producer his products derived from fat ducks and transformed by Fanny and Bertrand Fagot. 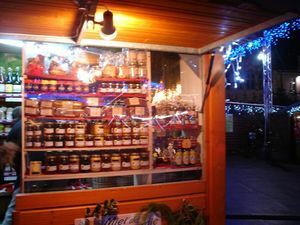 Fresh or preserved in the jars "Le Parfait", the products of the "Canardises" are absolutely delicious. In Hauts-de-France and in Reims in particular, I eat local ... what about you? From 4:30pm to 7:30pm in Bresles (Beauvais and Clermont) - Place du Linciau - under the Halle. For the third time, find many local producers at the "Flavor Market" who will offer you their products directly. Mrs de Caffarelli, "Le poulailler de Chaussoy" will offer you its eggs from outdoor that have just been approved Monday morning "Terroirs Hauts-de-France"! Large size (L) with beautiful "ocher" coloured yellows. These eggs were appreciated by the tasters. Congratulations to these breeders who bounced back after the fire that ravaged their farm two years ago. Fatima Corpet offers her ciders and jams, Virginie Coin, her maroilles pies, her "cœurs de picardie", Grégory Houet his poultry and youngsters (an exceptional dish to book ...). Friday, November 24 from 2:00pm to 8:00pm at the headquarters of the Regional Council Hauts-de-France, Lille. 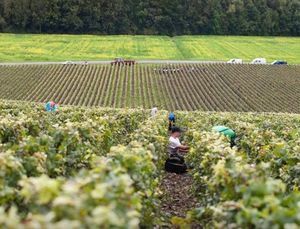 Second producing region of Champagne with nearly 3200 Ha of vines, the vine growers of the Marne Valley, around Château-Thierry, will make you discover their productions. Geoffrey ORBAN will lead a tasting workshop during which he will make you appreciate alliances between local products and Champagne. In Hauts-de-France and Lille in particular, I eat local ... and you? Champagne is drunk, of course, with moderation. 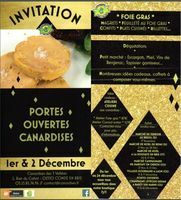 There is still some places left for the last FOIE GRAS WORKSHOP of the year, at "Les Canardises des 3 Vallées" in Condé en Brie, which will take place on November 25th from 9:30 to 2:00pm. It is a few kilometers from Château-Thierry. The foie gras is going to be a rare product this year. To be certain of its origin, nothing like buying directly from a producer. There are several in our region. 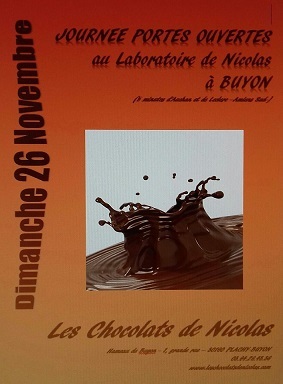 D - 6 before the day "Open doors" of the laboratory of "les Chocolats de Nicolas". It will be held on Sunday, November 26, 2017. Come to Buyon (Plachy Buyon) from 10:00am to 17:00pm to discover the world of Nicolas and other artisans, all passionate. We hope lots of you. Not to be missed ! 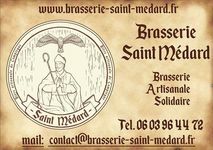 The Brewery "Au Coeur du Malt"
Will be present on the Christmas market of the Abbays of Chaalis (Oise) November 18 and 19. On this occasion you can enjoy our Christmas beer under pressure. We will also offer tasting boxes with Christmas beer, They will allow you to make an original and successful gift for the holiday season. We will soon be arriving at the festive season ... So, if you don't want to run at the last moment to find gifts, it is time to think about it and make purchases. Why don't offer local products? They will allow to share moments of conviviality around a drink or a dish. The "Relais Terroirs" are all points of sale that will allow you to find good products, to be guided in your choices and to receive beautiful gift baskets. So, do not hesitate to visit these passionate of products who will share with you their passion and their knowledge. Saturday, December 16, 2017 from 9:00am to 7:00pm, at the "Ferme des 4 saisons" - 597 rue de Beauvais - 60710 Chevrières. Many local producers and artisans will be present. A tasting on Friday, November 10 from 3 p.m. to 7 p.m., in the Oise, in Crèvecoeur le Grand (60360), at "Coeur de Picardie" Avenue du Château. 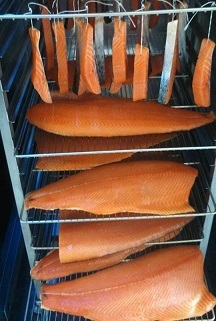 Come and enjoy smoked salmon in the Oise. With Virginie Coin Beauchamps, there is always something new! Gin from the Hautefeuille distillery in the Somme ... an original gift! To avoid running at the last minute to find gifts, it's time to think about it and shop. Why don't offer local products? They will share moments of conviviality around a drink or a dish. Gin, an original idea that will surprise! 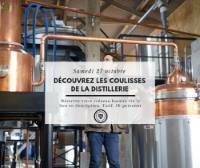 The "Distillerie d'Hautefeuille" is located in the castle farm - 3, rue Saint Antoine 80110 Beaucourt-en-Santerre. 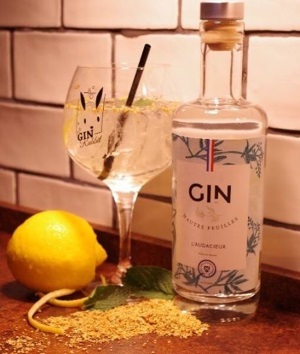 Étienne d'Hautefeuille and Gaël Mordac have teamed up to offer you an exceptional gin: The Gin "L'Audacieux". 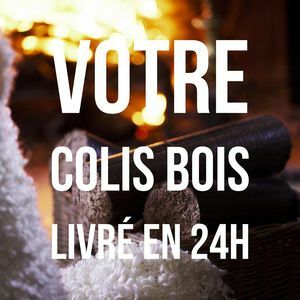 The distillery in Beaucourt-en-Santerre, the "Martigny and sons" shop - Gaël Mordac in Amiens, the "Temps des Mets" shop in Abbeville - Guillaume Leulier. From 4.30 pm to 7.30 pm at Saint-Just en Chaussée (between Breteuil and Clermont), on the square opposite the train station. For 5 years, they have been the monthly must-attend event for direct sales in the Oise! Like every 1st Friday of the month, find the producers for the direct sale of 100% local products. Mushrooms from Laigneville, Honey from Thiescourt, Eggs from Chaussoy-Epagny, Cresson from Bresles, Maroilles Pies and Crèvecoeur le Grand biscuits, Buicourt Cheeses, Sentelie's snails, Cider and Saint-Thibault apples, vegetables from Grivesnes and many other products. For 5 years, you have been faithful to these Rendez-vous du Terroir, which has become an example in terms of short circuits, direct relations between producers and consumers and friendliness. With potatoes, endive is certainly one of the most emblematic products of our region. Its uses are multiple. Raw or cooked endives attract more and more consumers. In salad, steamed, braised, with ham, pie ... endives can be combinated with everything. So enjoy it ! Thanks to Vincent Voisin (whose endives are marketed under "Prestige" brand) and to Adrien Bled (Fréchencourt) for having accepted to receive the journalists. Avec les pommes de terre, l'endive est certainement l'un des produits les plus emblématiques de notre région. Ses usages sont multiples. Crues ou cuites les endives séduisent de plus en plus de consommateurs. En salade, à la vapeur, braisées, au jambon, en tourte ... les endives se prêtent à tout. Alors profitez-en ! Merci à Vincent Voisin (dont les endives sont commercialisées sous la marque Prestige) et à Adrien Bled (Fréchencourt) d'avoir accepté de recevoir les journalistes. 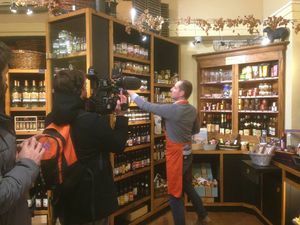 Learn more about the producers - Watch the report made for "Météo à la carte"
Friday, October 27 from 16:30 to 19:30 "Flavor Market" - Place du Linciau, under the "Halle de plein vent". For the second time, the producers will meet you for an absolutely gourmet moment! Water cress, cheeses, poultry, apples, honey, cakes, jams, fruits and vegetables, cider, eggs, pork, snails, beef ... you can find everything and prepare your future meals with local and quality products. The Flavor Market will take place monthly, every 3rd Friday. In Hauts-de-France and Bresles, in particular, I eat local food ... and you? So everyone in Bresles, Friday! 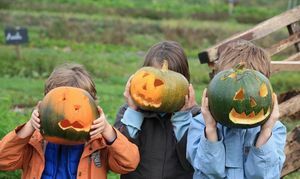 Wednesday 25th, Thursday 26th, Friday 27th, Saturday 28th and Monday 30th Oct - from 2.30pm to 5pm: Sculptures on squash, Tuesday 31st October: Makeup, "spider hunt" and treats for children, Wednesday 1st November: Tasting of squash in all its forms !! Enjoy without moderation of your passage to the picking to stock up on good vegetables: green beans! yes, fresh ... or to sterilize? Tomatoes from the garden, a real treat! but still leeks, cabbage, carrots, turnips .... again it's all a program! The Natexpo show opened at the Paris Nord Villepinte exhibition center. A biscuit factory of very high quality, "La Pierre qui tourne" from Attichy in the Oise exposes. Isabelle and Benoit Amélie meet you on their stand I 140 until the evening of Tuesday October 24th. Laurent and Isabelle Cnudde produce vegetables for many years. Thanks to this beautiful Indian summer, there are still strawberries at the Ferme du Chassy. So enjoy it! The store is open from 10 am to 12 am and from 4:30 pm to 6:30 pm from Wednesday to Friday and from 10 am to 1 pm on Saturdays. Do not forget that the vending machine is at your disposal outside the opening hours of the store. Many other vegetables and other local products are waiting for you. So everyone at Chassy's farm! Solo Pass : 5 € Solo Degust Pass (10 tastings): 12 € Duo degust Pass (20 tastings / 2 persons) :18 € • Under 16: Free • Lunch: adult 18 € / Child (under 12) 9 € • Tourist tour (1h30): 17 € with flute offered • Evening "Le Génie du Vin": 80 € - Daycare for 4-12 years: free. 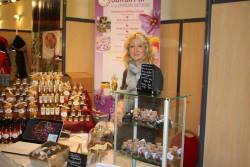 Ferdinand Lapersonne gives you an appointment this weekend in Villeneuve d'Ascq for POMEXPO. 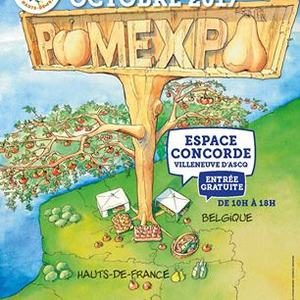 Do not miss this event in the Lille area, which takes place every 2 years. This is the opportunity to come and taste La Folie Douce Thiérache and especially the 2016 vintages, 3 of them were medalists at the local products competition in La Capelle Thiérache. Find "Des Hommes et des Boeufs" at the "Made in France" show. MIF Expo, the biggest fair dedicated to products designed and manufactured in France, awaits you on 10, 11 and 12 November 2017 at the "Porte de Versailles". You want to buy "Made in France" but find that it is difficult to distinguish the productions "really" made in France ? MIF Expo, the "Made in France" show, is for you !!!! 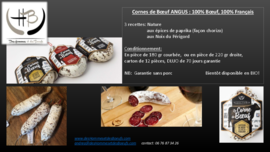 Come and visit Andréa De Poncins on the "Des Hommes et des Boeufs" stand, where you will discover the "Cornes de Boeuf ANGUS" (ANGUS Beef Horns), as well as "ANGUS Rillettes de Boeuf". From December 9th to January 7th will be held on the square of the town hall of Saint-Quentin, the village of Christmas! Entertainment Village for children, totally free and about twenty chalets will allow you to make gifts at the end of the year to your friends and family. The local products shop will be there for the seventh year over the entire period. Learn about www.laboutiquedesproduitsduterroir.com to find out the opening hours of the village. All the budgets, all possible packages in presentation or at the request at the last moment in the chalet. Do not hesitate to make a pre-order on the site www.laboutiquedesproduitsduterroirs.com. 8th anniversary of the "Brasserie des 3 loups"
Saturday night, a big, friendly evening awaits you from 8.30 p.m. to Midnight! 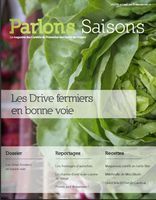 If you wish to receive this issue and the following, please send an e-mail to Anne Halgand, Picardie Product Promotion Committee. Exchange with local farmers and find the friendliness of the markets. You will appreciate the traceability, the proximity and the safeguarding of seasonal products. The producers are waiting for you for the contest of the best leek pie! Come many for tasting their products. You can also win packed baskets. 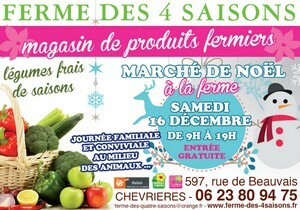 Taste the products of our farms ... from September to December! Farmers of the Welcome to the Farm network offer you many activities and festivities on their farms, around the discovery of their farm products and their terroirs. After the harvest and before the holidays, they offer you to share with them the delights of their terroirs and open their doors wide. A firm escape, so do not wait, enjoy the autumn, at the farm! 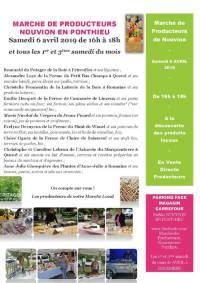 On the occasion of the Heritage Days, take the opportunity to visit the last mushroom farm in activity in the Oise. Ludovic Barré will share his passion for his profession and this magical place. After Bordeaux, Metz and La Roche sur Yon, Jim Bataille places his suitcases in the Oise and will meet you at Margny-lès-Compiègne, 1 hour north of Paris. To accommodate the 100,000 visitors expected, a site of 100 hectares has been laid out. You will find animations for young and old and many local producers from all French regions! Young farmers are mobilizing and everything is being set up little by little. We expect many of you ! 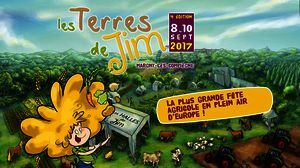 50th Cheese Fair, it's the unmissable event of the end of August in the Aisne..
- and of course the producers of Maroilles. Come and meet us on the booth of the Hauts-de-France Regional Council. You will be a lot of people during these next weeks to frequent the coast of the Somme Bay and the Bay of Authie. - "Soude maritime" and the "Obione". The on foot fishermen pick them every day for you. Raw or cooked these vegetables have all gastronomic properties which will seduce you. You can get them yourselves directly with the fishermen or local wholesale fish merchants. A lot of restaurants, propose them then take advantage of it! Watch out, the picking by non professionnals people is limited, thank you for respecting the regulations. Vegetables in the store but also at any time in the vending machine installed in the yard of the Farm.